I’ve been away from the blog for a while as I felt I needed some reflection time. Time to stop and contemplate. Time to consider and reflect. I wanted to take a step back from everything following the pace of life during degree show period. Both my creative and mental energy had been wholeheartedly consumed and I therefore decided to withdraw from participating in physical elements in favour of simply reading some theory. The fact I am now studio-less has partly contributed to this shift in thinking. Not that I’m saying you need a studio to make art, I’m just saying I am currently in the adjustment phase and therefore having a break. Yet when I say that and taking time out, I’m lying. I am not a person who takes time out and does nothing – that’s just not in my nature. I get twitchy and start doing the washing up or something. For me taking time out is putting a pause on the practical. Performance for the time being is not on the cards. But my creativity is still bubbling away as I have been dabbling in light painting activities and a little bit of photography. Yet these activities in themselves have been scarce as I’ll be consumed in a doodle mood one minute and then the next my sketchbook goes untouched for days. Books instead have become my predominant creative outlet for the time being. Have you ever read a book that changed your life? Or that you feel will stay with you for a very very long time? Well, that happened to me the other day with Hand Ulrich Obrist’s ‘Ways of Curating’. What a read! I have not ripped through a book so quickly in a long time. Having said that, I didn’t really have a spare minute over deadline and degree show time. Yet now that I have finished my degree, I have been sat reading in cafes and in the garden, watching people go by and observing daily life. Contemplating. Thinking. I’ve come to realise that my mind is very much designed for research; for absorbing information, words and visuals. I will be moving to Edinburgh next month to embark on an MSc in Modern and Contemporary Art: History, Curation and Criticism (I am aware that is quite a mouthful!) I could not be more excited as I feel Edinburgh is the perfect transition from Newcastle. In the interim period however I have been in Aberdeen, which is the city of death for anyone or anything creative in my opinion. I’m not saying that’s the case in every instance, but the lack of gallery visits is starting to agitate me. All the more reason that books have become my seducer. 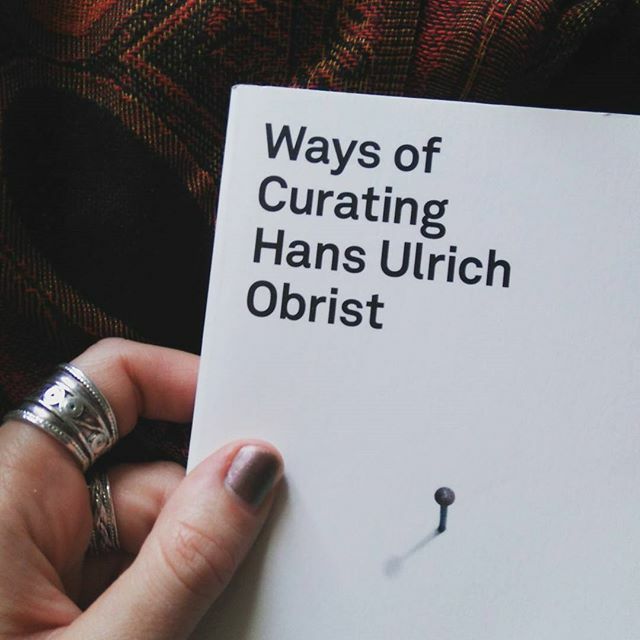 ‘Ways of Curating’ by Obrist has left quite the impression on me. Obrist is a world-renowned curator, critic and art historian. He is currently director at the Serpentine Galleries in London, has published a wide array of books, conducted endless artist interviews and revolutionized the way in which we think of curation. Needless to say, I found him and his professional exploits quite inspiring. Prior to reading this book, I had always viewing curating as quite a static activity. Arranging and rearranging the works of an artist in a room. Conversing with said artist to gauge their artistic needs. Engaging public with the final displayed work, etc. etc. How wrong I was! Obrist entirely transforms my way of thinking about curation with his discussions of shifting and temporal artistic platforms, the idea of curation as an artistic practice itself, the importance of stimulating conversations and the methodologies which surround and extend and exhibition beyond itself and into forms such as 24hr conversation marathons. For the first time, curating actually appeals to me as it is so much more than arranging art in a room. It is about bringing people together. About exchanging ideas and bridging cultures. It is about travelling and exploring. It is a journey of creation. It’s been a strange few weeks for me as I go from being a full time art student with a public show and a studio in the vibrant city of Newcastle, to being a graduate living in the granite grey city of Aberdeen over summer. Quite the shift. Yet it’s been a transformative one. I feel I have learnt from my period of non-production. I almost feel it has taught me more than when I am fully absorbed in my artwork. Somewhat ironic I know, but in those moments as I am fully aware of myself as a creative and an artist, yet it’s only really after all this reading and reflecting that I realise how much of a thinker I am. You might wonder why I have not turned to writing more given this has become the case. I’m not sure myself really, I just did not feel compelled. I suppose even that felt too creative. I wanted simply to sit back and read about others being creative and harness my energy through them. And I think it’s been a good idea as I am now inspired and itching to create again, in one way or another. I’m definitely hoping for a residency at some point. I am off to Berlin not long from now and for me that is just as much a research trip as a holiday with all of the beautiful art galleries and historical museums I’ll be visiting!